This helmet is made for forestry workers seeking the best combination of safety, and optimal ergonomics in daily work. It has the new UltraVision visor with only 20% light reduction giving a clearer view, and a 6 point harness for comfort and less pressure. 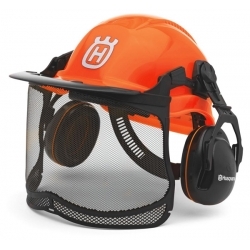 Hearing protection with optimal ergonomic design facilitates prolonged use. Best choice in respect of comfort and individual preferences.